Who is Pakistan's Real Hindu Majority? Sadia Mahmood is a Fulbright Scholar-in-Residence for the year 2017-2018 at Champlain College in Vermont, where she is teaching courses on Pakistan. She has a Ph.D. in Religious Studies from Arizona State University and specializes in religion in modern South Asia, with a particular interest in relations between nation-states and religious minorities. Sadia has taught at Lahore University of Management Sciences, Lahore, and shall be joining the National Defence University, Islamabad upon her return this year. She is currently working on her first monograph, tentatively called: Pakistani Hindus, The Making of a Minority (1947-1971). Since the founding of the post-colonial state, there has been a continual exodus of Hindus from Pakistan. Based on this empirical observation, the book investigates what in terms of power relationships changed for Hindus in the post-colonial era, so that it became difficult for Hindus to continue living where they had prior to the Partition. 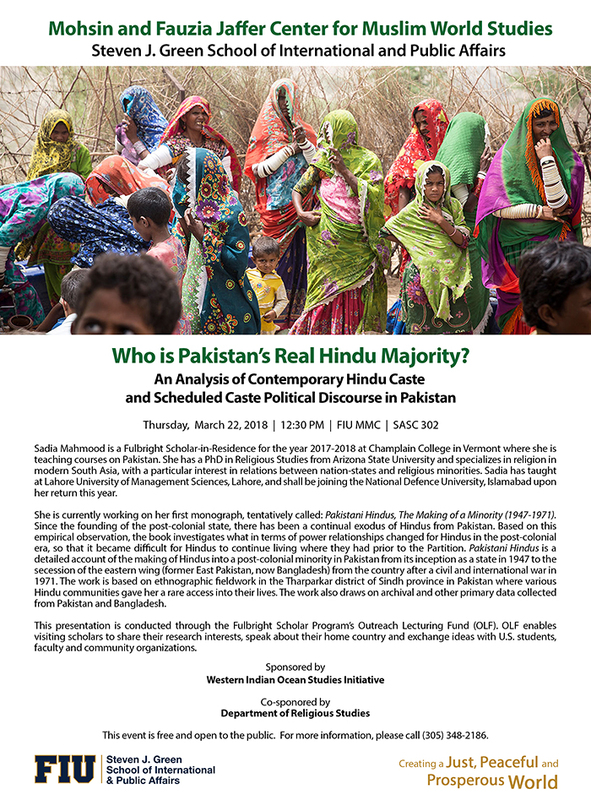 Pakistani Hindus is a detailed account of the making of Hindus into a post-colonial minority in Pakistan from its inception as a state in 1947 to the secession of the eastern wing (former East Pakistan, now Bangladesh) from the country after a civil and international war in 1971. The work is based on ethnographic fieldwork in the Tharparkar district of Sindh province in Pakistan where various Hindu communities gave her a rare access into their lives. The work also draws on archival and other primary data collected from Pakistan and Bangladesh. This presentation is conducted through the Fulbright Scholar Program’s Outreach Lecturing Fund (OLF). OLF enables visiting scholars to share their research interests, speak about their home country and exchange ideas with U.S. students, faculty and community organizations.